I went to college in the new B. C. (before cell phones), so I’ve often wondered how different those years would have been with modern communications tools. I mean, back in the day, on Thursday nights everyone just knew that me and my crew waited until after Seinfeld before we rolled into Schooners for quarter taps. Now, we’d be able to announce our intentions on Facebook, check into the bar when we arrived, and create a special hashtag for our typical Thursday shenanigans (#PartyLikeARockStar). Like my reminiscences, the awesome Twitter account, Modern Seinfeld, attempts to place a 90s classic into the modern age. 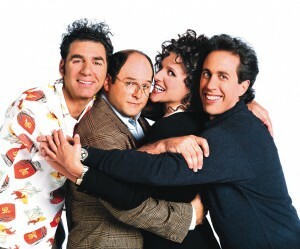 Basically, Modern Seinfeld posits likely Seinfeld scenarios as if the show was still airing. Elaine has to decide when to upgrade her new boyfriend to a priority alert ring on her VoIP phone. Unfortunately, by the end of the episode they break up because she finds out he’s selectively rejecting her calls using his phone system. George has been using the remote office feature of his VoIP phone system and hasn’t actually gone into work at Yankee Stadium in years. He’s shocked to find the old stadium demolished and a new one up in its place. Jerry’s parents start using a prepaid cell phone and since Jerry’s configured his VoIP phone to block all anonymous calls, his parents can’t get a hold of him. They fly up from Florida, convinced something terrible has happened to him, and burst in on him and his new girlfriend. The girlfriend breaks up with Jerry because she thinks he’s a horrible person for “ignoring” his parents. As Kenny Bania would say, “That’s gold, Jerry! Gold!” But, in all seriousness, Seinfeld hasn’t changed, but our communications capabilities and expectations sure have. While Jerry and the gang would basically use that technology for evil or mischief, these features make your business more mobile, reliable and flexible. Just don’t hire George. Ever. Just think, Jerry could have retrieved this message, http://www.youtube.com/watch?v=vyEHjdId2EQ, from Crazy Joe Davola via a wav file! !